Israeli-Gaza Conflict Squeezes Palestinian Leader On All Sides : Parallels The recent violence has increased stress and exposed rifts among Palestinians. Nearly everything Mahmoud Abbas does angers either moderates or hard-liners, making his position almost untenable. While the Israel-Gaza conflict pits Israelis against Palestinians, it has also increased stress within the Palestinian leadership. The Gaza Strip is run by Hamas, which the U.S. considers a terrorist group and favors a strategy of resistance. The West Bank is run by Fatah, which is more moderate and favors an olive-branch approach. Last month, Hamas and Fatah created a coalition government, angering Israel and helping to end Mideast peace talks. 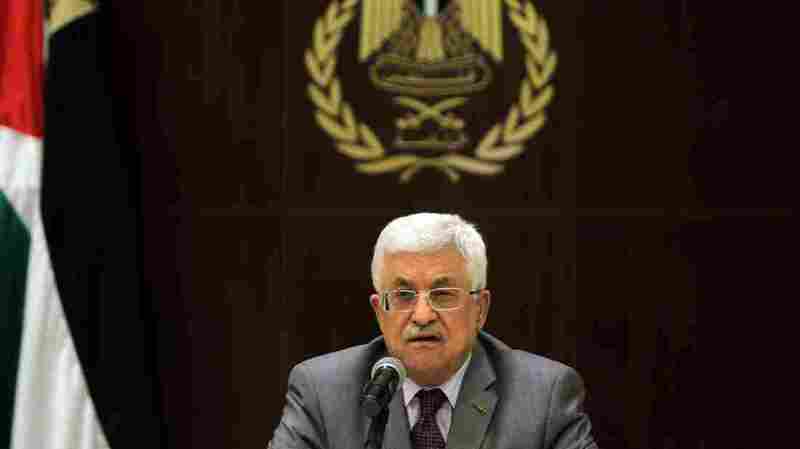 Mahmoud Abbas, who leads that government, is in an almost untenable position. And at this point, almost no one is happy with him. On the olive-branch side is Emad Dayyah, a consultant from Gaza who travels to the West Bank every week. He has pretty much given up on Abbas. "I think he spent a lot of efforts to give peace a chance, but it seems he's not being supported by the international community and by Israelis, and even by Hamas people," Dayyah says. "He is handcuffed, absolutely. He cannot do anything." Musah Falleh, who's in the resistance camp, spent seven years in an Israeli prison for plotting to kill a settler. He was released in a prisoner exchange a few years ago. Now Falleh is treated as a hero in the Am'Ari refugee camp where he lives. "First and foremost, Mahmoud Abbas has to stop security coordination with Israel," he says. "Second, he must stop all communication with Israel. Third, and most important, blood is their language, so our language should be blood as well." Blood is not the language of Abbas. He has accused Israel of committing "genocide" against Palestinians, and he has criticized Hamas for firing rockets on Israel. Jewish groups condemned him for the first comment. Hamas leaders condemned him for the second one. "Whatever Mr. Abbas does," says Nabil Shaath, one of Abbas' senior advisers, "he will look helpless to his people. He doesn't have tanks. He doesn't have airplanes. He doesn't have rockets, and he does not believe in violence." Shaath suspects that Israel wants to see Abbas weakened. Israel's government was unhappy when the Palestinian unity deal went through, and driving a wedge between the groups could break the coalition. "This is a declared Israeli objective," he says. "Of course, in a situation like this, it hampers unity and makes it very difficult." It's hard to see how the Palestinian leader emerges from the conflict, says Radi Jara'we, a professor at Al-Quds University in Jerusalem. "I think he tried to do something, but he did not succeed," Jara'we says. Supporters of Abbas would say he is not finished trying.